Saffron is the most expensive spice in the world. As a matter of fact, ounce for ounce, it is more costly than gold! Saffron is harvested by hand from the three stigmas of the itty bitty crocus flower in Spain. It is this painstaking task that is primarily responsible for high the price. Although saffron is used, in part, to tint foods yellow, the unsoaked strands are dark reddish-orange. The deeper the color, the higher the quality. Although it is also sold as a powder, it is advisable to only buy threads. Saffron powder is often doctored with non-saffron ingredients to increase profits. Saffron strands are usually soaked in warm water or milk to release the flavor and color. The infused liquid is then added to the dish. 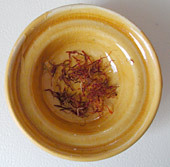 Saffron is used to flavor and tint many dishes. It has a very delicate taste, but is highly aromatic. It is especially popular in Indian cuisine such as curry and rice recipes, but is also used in paella, bouillabaisse and risotto. Store saffron in an airtight container away from bright lights and heat. This entry was posted on Saturday, November 3rd, 2007 at 6:52 am	and is filed under Encylopedia, Herbs & Spices. You can follow any responses to this entry through the RSS 2.0 feed. You can leave a response, or trackback from your own site.